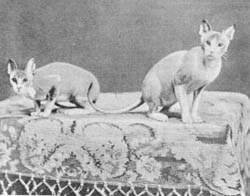 Large ears, small ears, folded ears or straight ears. Cats ears come in many different shapes and sizes. Cat ears have two functions, to detect sound and for balance. 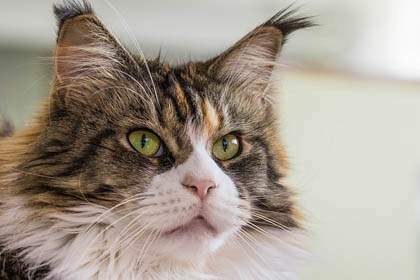 Cats have exceptional hearing, much better than ours. So superior is their hearing to that of humans, they are able to hear high frequency sounds undetectable to the human ear, between 50-60 kilocycles (or kilohertz), compared to humans, who can capture approximately 16-20 kilocycles. Within the inner ear is the vestibular system, consisting of semi-circular, fluid-filled canals and the otoliths, this vestibular system controls balance. The outer ear. This consists of the ear flap (pinna or auricle) and the ear canal (external auditory canal). The middle ear. This consists of the eardrum (tympanic membrane) and the auditory ossicles (small bones). The inner ear (labyrinth). Comprising of the sensory structures of hearing and balance. The middle and inner ears are located within the skull. Every cat carer should routinely check and have their ears cleaned when necessary. This way, if there are any problems, they can be picked up quickly. Check the ear for dirt, odour, lumps, redness, and pain. If any of these are observed seek veterinary attention immediately. An ear hematoma (also known as aural hematoma) is a localised collection of clotted blood from broken blood vessels on the ear flap (pinna). This hematoma trapped between the skin and the cartilage of the ear. When the cat scratches or shakes it’s head it eventually causes a blood vessel to rupture, resulting in a hematoma. Ear hematomas are extremely painful and require prompt veterinary attention. 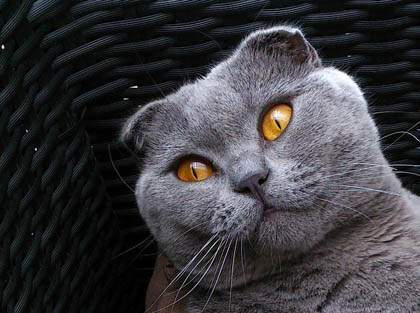 Read more about ear hematomas in cats here. 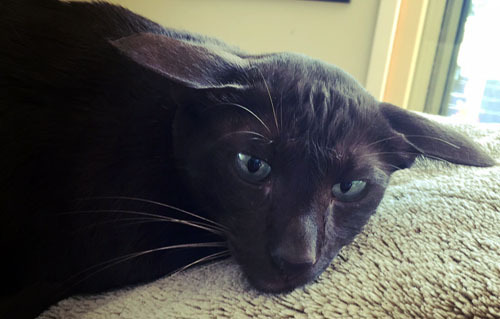 Ear mites are a common spider-like external parasite which causes significant discomfort to the cat. Although the name would suggest otherwise, ear mites can live on any part of the body although they generally live in the ears of cats. They are the most common cause of otitis externa (inflammation of the outer ear canal) in cats. Not all cats will display symptoms of ear mites but often they will scratch at their ears and or shake their heads. Read more about ear mites here. Otitis externa is an inflammation of the outer ear canal. There are many possible causes, but the most common is an ear infection caused primarily by bacteria or yeast. Read more about otitis externa here. White cats, cats with white ears, noses or bald cats are most susceptible to sunburn. This is because of the lack of melanin (skin and hair pigment), and protective hair in these areas. It occurs most often on the ears, however, eyelids and the nose are also at risk. Initially, exposure causes mild redness, hair loss along the ear margins. Scaling, thickening of the skin and itching occur over time. 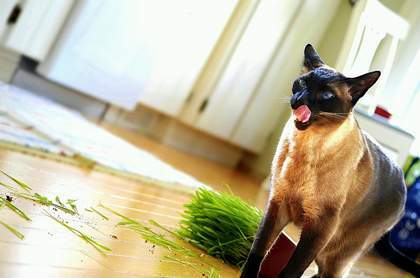 This may cause your cat to shake his head and scratch at the affected area causing bleeding and infection. Dermatitis becomes progressively worse each summer until persistent ulceration and squamous cell carcinoma can develop. Read more about sunburn in cats here. Squamous cell carcinoma (SCC) is a common malignant tumour of the skin. Most often due to excessive exposure to sunlight, it is seen more in white cats or cats with white patches. Tumours can appear anywhere on the body although areas most commonly affected are the ears, nose, mouth, and eyelids. SCC’s are slow to metastasis and remain confined to the skin for some time. If untreated, SCC can spread to regional lymph nodes and distant metastasis, most often the lungs. Read more about squamous cell carcinoma in cats here. Frostbite is the destruction of tissue due to extreme cold. Cats exposed to severe winter conditions where temperatures fall below zero can be affected by frostbite. The ears are extremely vulnerable because they are more exposed than other parts of the body and only have a light covering of fur.